For those who might have missed it there is an interesting Technical Feature in the March, 2011 issue of the ASHRAE Journal. The article deals with "Energy Savings for Quick Service Restaurants" but some of the research applies equally well to other applications. 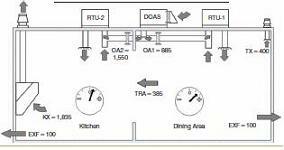 The article covers several energy saving measures for restaurants and includes a section on the mechanical cooling. The recommendation of the writer is to combine the benefits of a DOAS unit with conventional rooftop packaged HVAC units to achieve a significant energy savings. This same savings can be found when this concept is applied to school classroom wings, small single-story office buildings, or any building where the "normal" HVAC solution would be a series of 10 to 15 ton rooftop units. The writer suggests a system that has a DOAS unit conditioning the total ventilation air requirement for the building but putting the dehumidified and filtered outside air into the return air ductwork for several pieces of conventional rooftop equipment. This has the effect of both removing the latent load from the conventional equipment and lowering the return air temperature of the standard rooftop equipment. The result for the conventional equipment is that it can be downsized significantly. Downsizing rooftop HVAC units from the 10 or 15 ton size down to a 5 or 7.5 ton size will not only reduce capital costs for the project as a whole but, in general, packaged HVAC equipment has a higher EER in smaller sized equipment. That is because it often begins to fall into equipment categories that are covered under Federal and State energy codes for residential applications. The "blended" EER of the total system could actually go up as a result. That is one reason why it is important to look at the impact of design decisions on a holistic basis whenever possible.